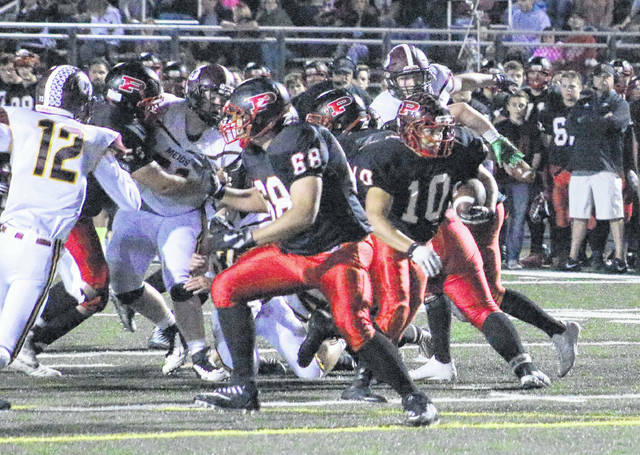 Point Pleasant senior Jacob Brumfield (10) breaks away from a pile during a Week 8 football contest against Meigs in Point Pleasant, W.Va.
Last Week: Westside defeated River View 62-20, in Clear Fork; Point Pleasant defeated Man 45-0, in Point Pleasant. Last meeting between the teams: Oct. 28, 2016. Point Pleasant won 52-14 in Clear Fork. WHS offense last week: 471 rushing yards, 126 passing yards. PPHS offense last week: 277 rushing yards, 208 passing yards. WHS offensive leaders last week: QB Travis Cook 9-11 126 yards, 1TD; RB Matt Blankenship 17 carries, 177 yards, 1TD; WR Dwight Justice 4 receptions, 74 yards. PPHS offensive leaders last week: QB Cason Payne 9-25-0 208 yards, 1TD; RB Cason Payne 8 carries, 122 yards, 2TDs; WR Josh Wamsley 8 receptions, 84 yards, 1TD. WHS defense last week: 68 rushing yards, 202 passing yards. PPHS defense last week: 9 rushing yards, 20 passing yards. 1. Last season was the first-ever meeting between these teams. Point Pleasant has won nine straight regular season finales. The last time PPHS dropped the final game of the regular season was 2008, when host Chapmanville handed the Big Blacks a 27-6 defeat. 2. The Big Blacks and Renegades shard two common opponents to this point in the season, in Man and James Monroe. Both teams shut out Man, Point Pleasant by 45 points and Westside by 25. In Week 2, the Big Blacks claimed a 20-14 win over JMHS, which defeated WHS 52-7 on Oct. 6. 3. Through nine weeks, PPHS is averaging 273.1 rushing yards and 159.3 passing yards per game. The Big Blacks have earned 166 first downs, while averaging 37.9 points per game. 4. Justin Brumfield is leading the ground attack for PPHS so far this fall, rushing for 1,095 yards and 14 touchdowns. Cason Payne — who has 881 yards and 14 touchdowns on the ground — is the team’s leading passer with 1,417 yards and 15 touchdowns. Point Pleasant’s leading receiver is Josh Wamsley, who has caught 33 passes for 534 yards and five touchdowns. 5. Point Pleasant enters Week 10 at eighth in the Class AA playoff ratings, while WHS is 22nd. PPHS is one of nine AA teams with at least seven wins. A total of 23 AA teams enter play with a winning record. Last Week: Hannan lost to Gilmer County 46-6, in Ashton; Phelps defeated Jenkins 50-0 in Phelps. Last meeting between the teams: Oct. 7 2016. Phelps won 38-0 in Ashton. Current head-to-head streak: Phelps has won 1 straight. 2. Phelps opened the season with a three-game winning streak, before dropping four straight decisions. The Wildcats dropped their first three games of the season, won-back-to-back, and has dropped three straight since. 3. This is the final road game of the year for Hannan, which has won one of its four previous trips. The Hornets are 1-2 in Phelps this season, and are playing in front of their home fans for the final time this year. 4. Hannan has been outscored by a 227-to-100 clip this fall, while falling victim to three shut outs. Meanwhile, Phelps has outscored opponents 200-to-162. 5. Phelps is currently third out of three teams in the KHSAA Class 1A, District 8 rankings. In the WVSSAC Class A playoff ratings, Hannan enters Week 10 at 34th.